ROAR! 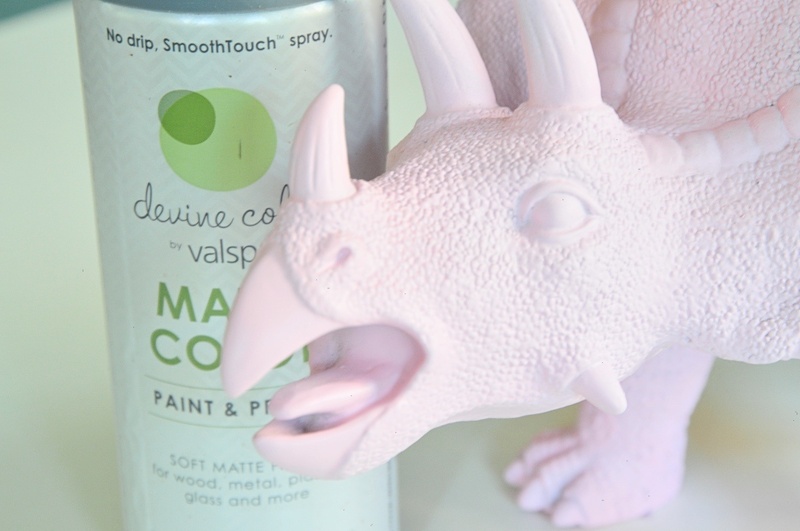 This DIY Dinosaur Planter is so fun and cute! 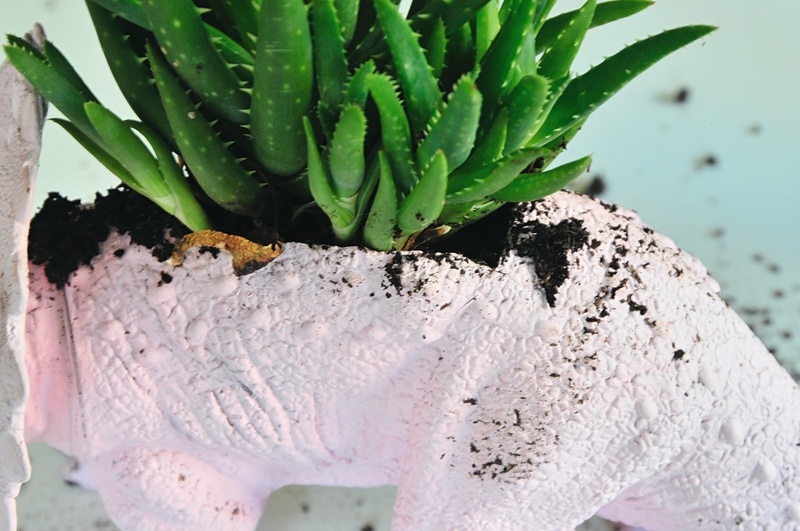 It’s a great planter for succulents and it’s great for air plants too. It’s super happy, fun, and silly! I made mine in pink – but you could make these any color of the rainbow. You could even gold gild them too. 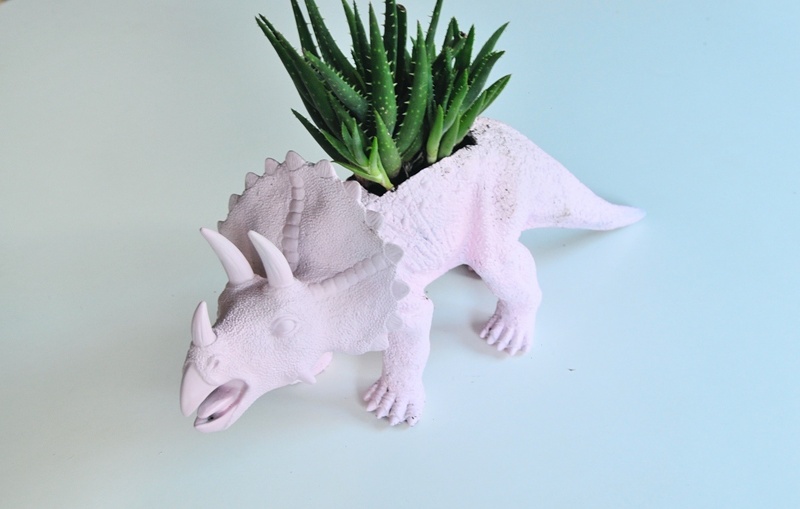 I can imagine this Dino Terrarium in a boy’s bedroom or given as a gift to a science lover! 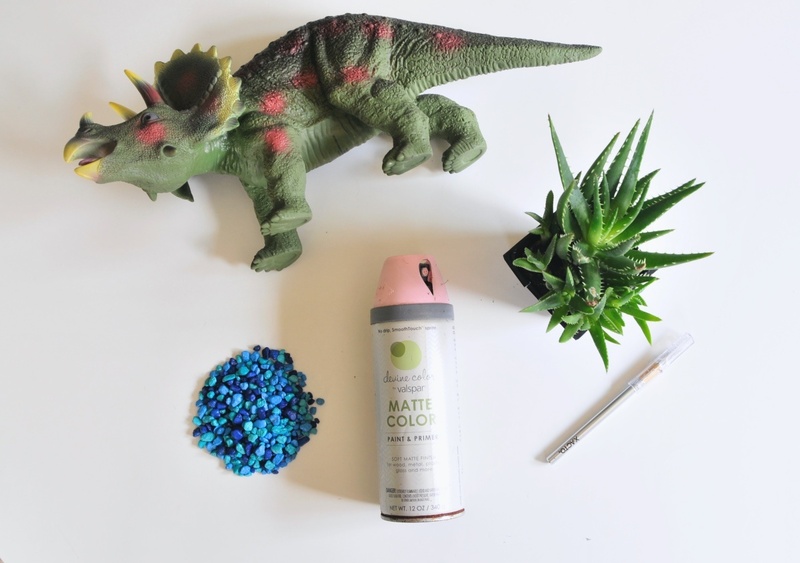 All you need are a few simple supplies to make your DIY Dinosaur Planter! 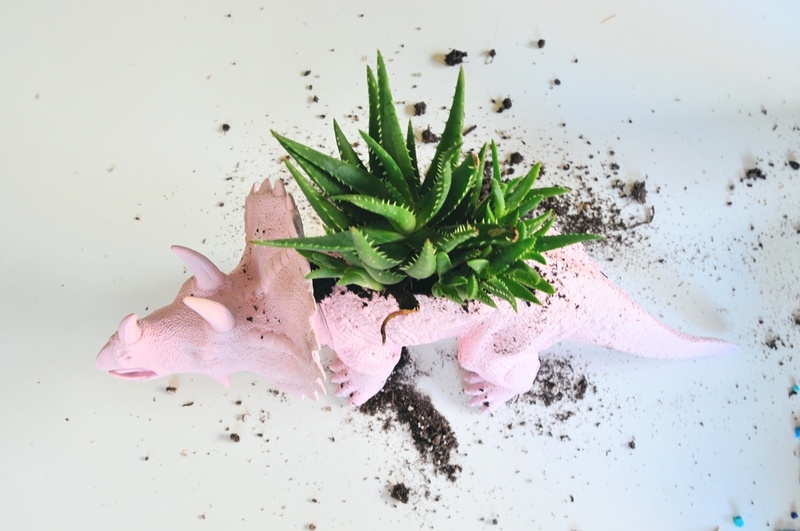 The hardest part of making this DIY Dino Planter is finding the right Dino Toy! Sizing on these guys is actually super confusing. I’ve ordered many that say they are “9 inches” but are actually around 4 inches across or so and significantly too small for a terrarium. And definitely don’t trust words like “large” or “extra large” when they are describing dino toys! Look for images that show the dinosaur with a ruler. Most toy companies are measuring a toy from it’s head to tail – so a 9 inch Brontosaurus from head to tail – is really only a few inches through it’s body. After a hard search, I found these here which are the best. 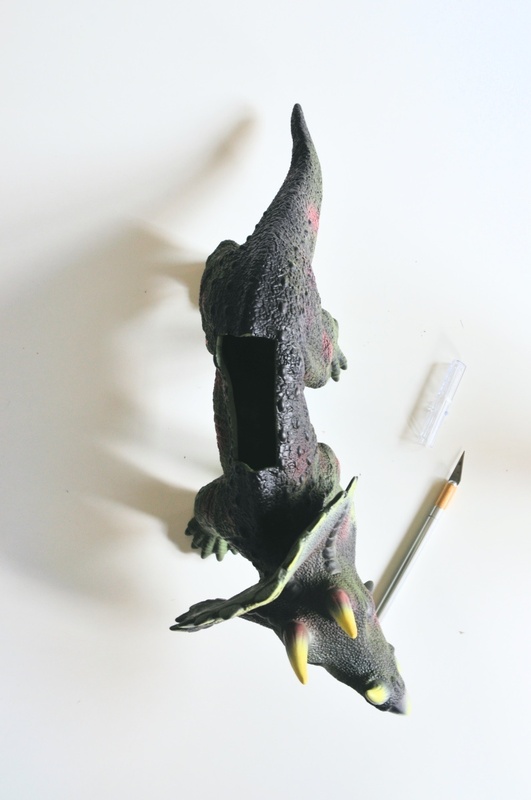 Most dinosaur toys are soft and can be easily cut with an X-Acto Knife. But occasionally you end up with a hard plastic one. If it’s hard plastic, use a drill to make holes around the border of what you will cut. Like making a perforation. Then use a small knife to cut between the drilled holes. Here’s a great image of that process. 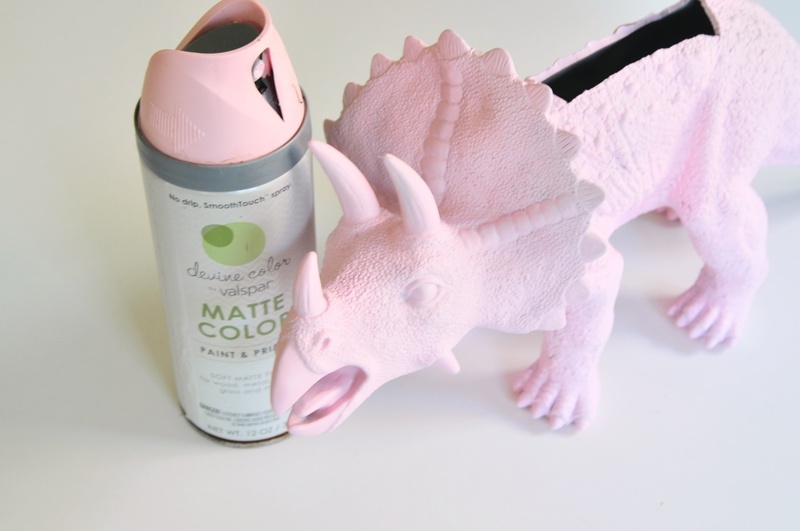 I wanted to make mine super cute, so I sprayed mine with matte pink. If you want to use spray paint, be sure that it’s plastic safe. You may even want to test a small area first, to be sure. Some spray paint stays sticky on plastic – even when it says it won’t so testing a small area can save you a lot of headaches down the line. 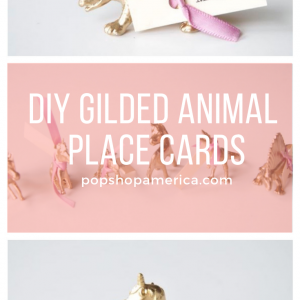 If you prefer, you could use house paint and liquid gilding instead – the metallic sheen of gilding is one of my favorite things in the world! Once your paint is completely dry. It’s all about adding the rocks, plant, and additional soil! 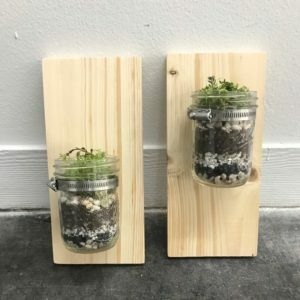 Here’s our easy how to guide if you want to learn more about How to Build a Terrarium. In a nutshell, always add rocks to the bottom. This is so the water will drain away from the roots when you water your plant. Next, add the plant. Pull the soil away from the roots and gently spread the plant out a bit. 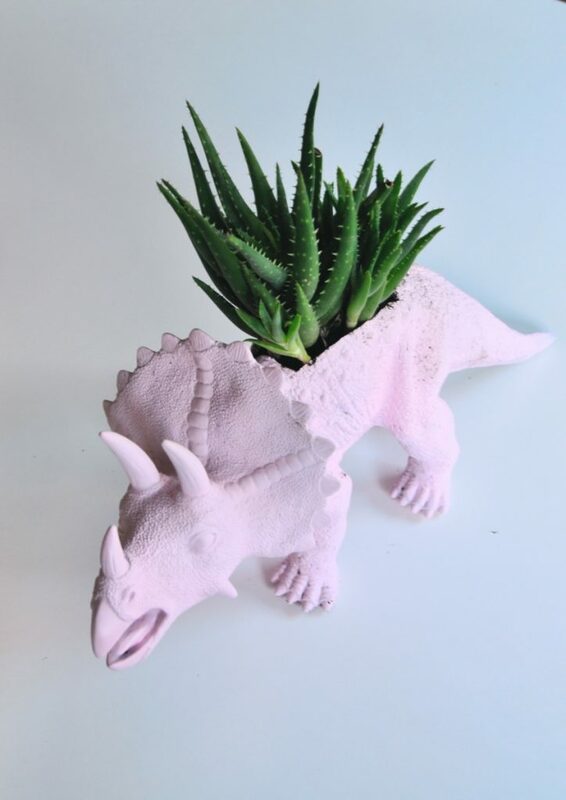 Once you get the plant properly placed, hold it in one hand and fill the rest of your Dino Planter with soil. Now it’s just about brushing the rest of the soil from your planter and finding him or her a good home! Succulents, cactus, and air plants all need to be near a window. It doesn’t have to be super bright – partially sunny is ideal. And they all need to be watered – succulents a few times a week. Cactus and air plants perhaps once a week. 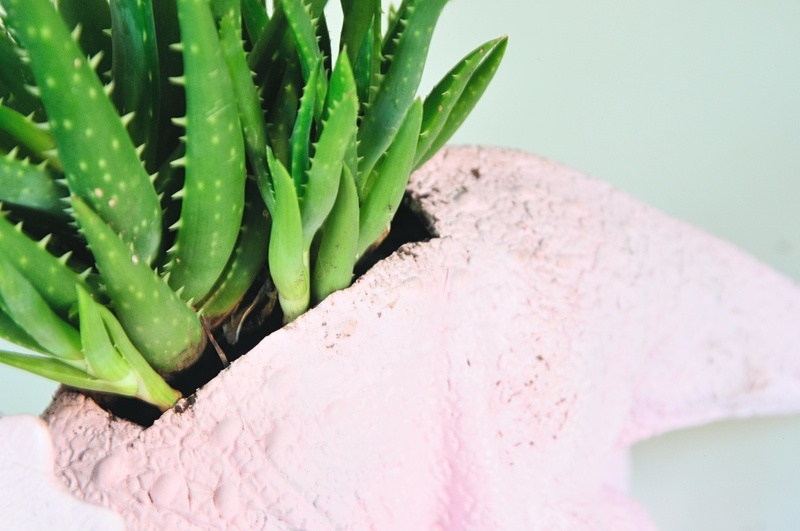 You can find a succulent and cactus care guide here. 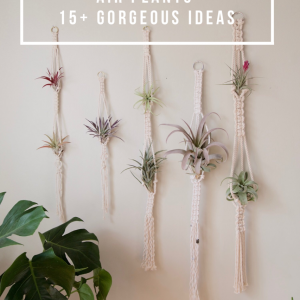 And find our Air Plant Care Guide here! And viola – you’ve got a healthy plant and a super cool Dinosaur Planter! ROAR! !